Cable AML offers a full range of digital transmitters with output power ranging from 30 watts to 5 kW and with configurations ranging from a single program to several programs. Interested in our UHF Transmitters? 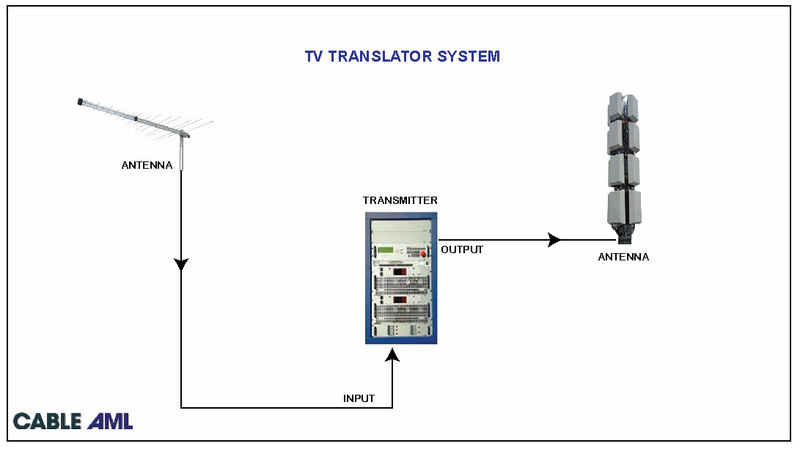 TV Translators are television transmitters fed by a signal from a primary transmitter at a different frequency than the Translator’s broadcast frequency. They are used to expand the broadcast range of a television station beyond the primary signal’s coverage area, or to improve service in a part of the main coverage area which receives a poor signal due to geographic obstacles. Cable AML offers a complete line of low, medium and high-power TV Translators and can also provide integrated systems including input and output antennas, cables and accessories. A DTT system includes as a minimum the Digital Headend, the Transmitter and the Antenna with their accessories. Many systems also incorporate Repeaters (to improve coverage area of the main transmitter) and STL Microwave Links (transmission links from the studio to the transmitter). The DVB-T2 is the most widely adopted and deployed standard for Multichannel Digital Television transmission system (simultaneous transmission of several TV programs), as it is more robust than its predecessor, the DVB-T system. The DVB-T2 system improves the previous DVB-T not only in strength but in capacity, providing an increase in the transmission capacity of about 50% compared to DVB-T. 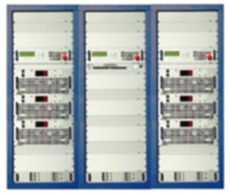 The ATSC system uses 8VSB modulation. It can transmit a total of 19.39Mbits per second, which allows the transmission of one or multiple TV programs, SD or HD, with resolutions from 640×480 up to 1920×1080 per 6MHz channel. 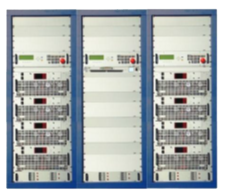 The ISDB-T/Tb multicarrier system uses the same COFDM modulation as the DVB-T / T2 and also allows the transmission of a combination of one or multiple TV services, SD or HD, and can operate in the SFN (Single Frequency Network) mode. The GAPFILLERS are single-channel or Multichannel Repeaters designed to extend the range of a digital TV SFN (Single Frequency Network), making it possible to provide good coverage for shadowed areas. 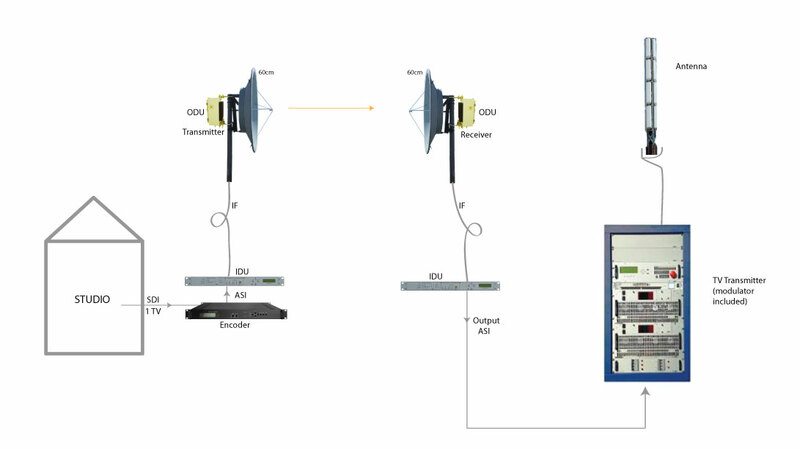 The Gapfiller Repeater provides extended digital coverage by using echo cancellation circuitry to cancel system feedback between the transmitting and receiving antennas. This means that stable operation can be achieved even with a feedback (undesired) signal larger than the incoming (desired) signal. The Gapfiller Repeater low latency ensures that the received and transmitted signals do not interfere with each other. 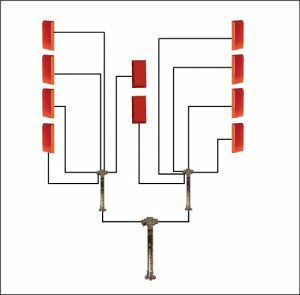 An antenna system consists of the radiating elements and accessories such as the connecting transmission lines (typically coaxial cables) cables between the transmitter and the antenna elements, the interconnecting cables between antenna panels, the outdoor power splitters to feed the panels and pressurization equipment for the transmission line, if necessary. A typical system like the one shown in the diagram includes power splitters and jumper cables feeding all the panels. The Headend consists of modules that encode and combine local television signals or digital signals from satellite receivers. The signals are received, processed and combined in a multiplexer typically in the so-called ASI format for transport to the TV transmitter. 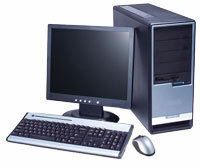 Other functional modules in the Headend include: CAS (Conditional Access Systems) for encryption, where required Electronic Program Guide SMS (Subscriber Management System) and its interface with the Billing System In addition to encoding and multiplexing TV programs, the Headend may also incorporate SFN (Single Frequency network) adaptation equipment if required. Ability to remotely disconnect the signal to subscribers who do not pay. Signal safety: to stop unauthorized users (“piracy”). 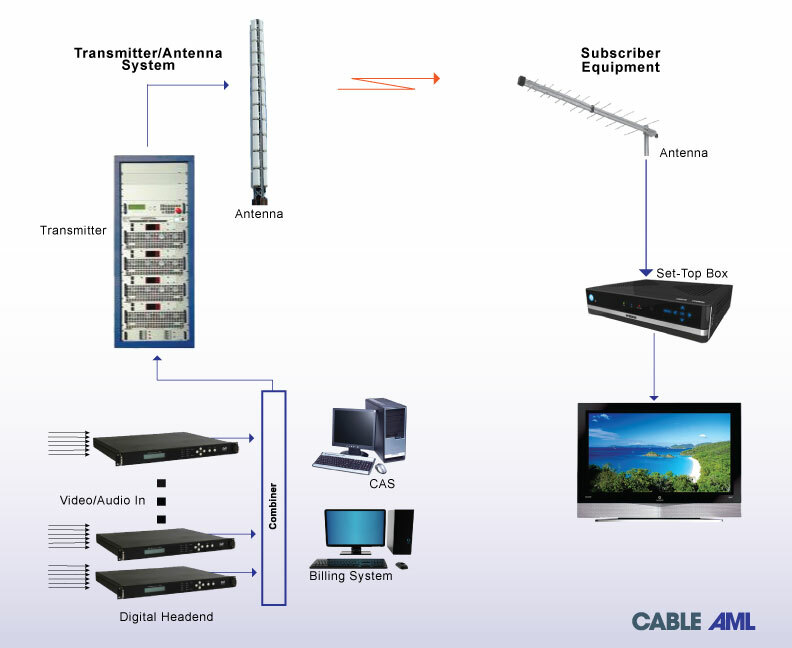 Cable AML can integrate into the system any of the TDT CAS systems on the market. We can also recommend specifically optimized for DTT systems with a high level of functionality and high security at a reasonable cost.